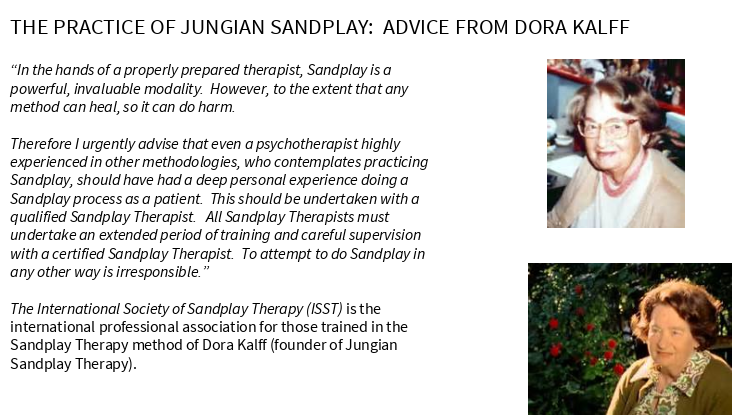 Sandplay Therapy is a method of psychotherapy and personal development. It was developed by Dora Maria Kalff in Zollikon, Switzerland. (1904-1990) who integrated Jungian Analytical Psychology and Buddhist Philosophy to create this powerful and creative form of working with the unconscious. Sandplay is playing with sand and miniature toys and figures. It is for children and adults of all ages. Many adults are surprised by how liberating and powerful the Sandplay process is. 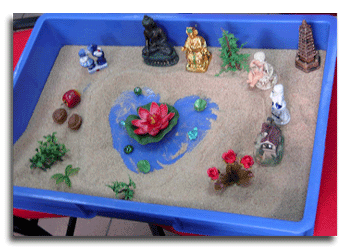 Sandplay Therapy creates a bridge between the conscious and the unconscious. It facilitates the dialogue with the unconscious and through the healing power of symbols, Sandplay heals the deep wounds, regains balance of the psyche, and allows the person to become whole. Based on Depth Psychology of Carl Jung, Jungian Sandplay falls back on a rich history of over seventy five (75) years of clinical application by psychologists and therapists from around the world. It is considered one of the most potent yet safe methods, and has been found to be effective in working with a wide range of personal issues – from inner conflicts, depression, abuse, trauma, etc. The unconscious, according to Jung, refers to temporarily forgotten information as well as repressed memories specific to an individual. An example of this are childhood memories, both positive and negative that may be impacting on one’s current attitude, mindset and disposition. The unconscious refers also to latent memories from universal predispositions and innate energies imprinted in our mind. Fear of the dark, or of snakes and spiders and mother-child attachment might be examples of these predispositions. The more we are unaware of our unconscious, the more we behave or make decisions that may make us conflicted, anxious, disillusioned, empty, depressed or even physically sick. The goal of Sandplay Therapy is to facilitate connection of the conscious and unconscious through the power of symbols in the Sandplay to achieve healing and integration. It is also for everyone seeking inner integration or a yearning to be “ whole”. When one is “ whole” or “ integrated”, he is not perfect but has a deep appreciation & acceptance of his strengths and limitations and also that of people in general. When one is “fragmented” inside (opposite of being whole), he may experience some kind of “dysfunction” or inner conflict which may be experienced in different ways such as emptiness, disillusionment (marriage, family, relationships), loss of meaning, high anxiety, anger, addictions, depression and inconsistent behavior. In this current age and time that rushes toward the future, the simplicity and depth of Sandplay provides a space for contact with the inner, symbolic world. A basic premise of Sandplay is that psyche possesses a natural tendency to heal itself, given the proper conditions. Similar to our physical wounds that heal under beneficial conditions, the psyche has an instinctual wisdom that emerges when able to operate naturally. Sandplay is “hands on” psychological work, and is an adjunct to talk therapy. It is a powerful therapeutic method that facilitates the psyche’s natural capacity for healing. In a “free and protected” space provided by a trained sandplay therapist, the client creates a concrete manifestation from his or her imagination using sand, water, and miniature objects. In this way Sandplay helps honor and illuminate the client’s internal symbolic world, providing a place for its expression within a safe container. With sufficient time and understanding, a sandplay experience can lead the client into layers of experience that are pre-verbal and long forgotten to the conscious mind. Through the tangible emergence of personal and archetypal symbols in the tray in a safe environment, the client moves toward a sense of balance and wholeness.